Foundation, the Alaska Chapter of Safari Club International and our sponsors who are listed on the cover page of the application. The program helps train interested youth so that they will have the knowledge and skills to support fish and wildlife conservation and the important human traditions associated with those resources. The program is primarily for high school juniors and seniors but is also open to sophomores if there is room. 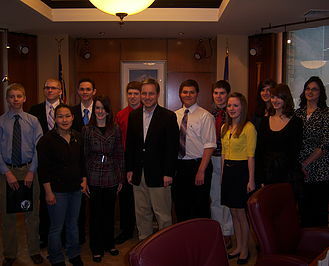 The general outline includes a trip to Juneau with visits to the Governor and Lt. Governor's office, some of the Governor's cabinet members, and legislative offices. It also entails working in the legislative process and discussion of timely issues. Each year there will be one student chosen from the group to attend the American Wilderness Leadership School in Jackson Hole, Wyoming. If you would like to be considered for participation in this program, click on the following link and fill out the application.